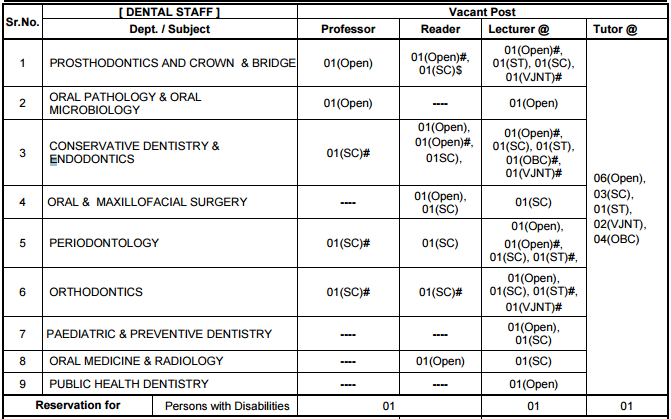 Tatyasaheb Kore Dental College & Research Centre (TK Dental College & Research Centre), Affiliated to Maharashtra University of Health Sciences, Nashik invited applications for recruitment to 73 Dental & Medical Staffs posts. The candidates eligible for the post can apply through prescribed format on or before 27 September 2016. Eligibility for Dean/ Principal Post: a) A BDS degree of an Indian University or an equivalent qualification. b) Post-Graduate qualification / Diplomat of National Board in the subject. c) Experience as Professor for not less than 5 years in a Dental Institution. Eligibility for Professor Post: a) A BDS degree of an Indian University or an equivalent qualification. b) Post-Graduate qualification / Diplomat of National Board in the subject. c) 5 years teaching experience as Reader. Eligibility for Reader Post: a) A BDS degree of an Indian University or an equivalent qualification. b) Post-Graduate qualification / Diplomat of National Board in the subject. c) 4 years teaching experience as Lecturer. Eligibility for Lecturer Post: A recognised MDS degree of an Indian University / Diplomat of National Board or an equivalent qualification. Eligibility for Tutor Post: A recognised BDS degree of Indian University or an equivalent qualification with at least one year experience. Eligibility for Reader Post: a) Requisite recognized PG Medical qualifications in the concerned Subject. b) Minimum of 4 years teaching experience as Lecturer / Assistant Professor in a recognized Medical college / Institute in the concerned Subject. c) Minimum of two Research publications in indexed / National journal. Eligibility for Lecturer Post: a) Requisite MBBS qualifications recognized by MCI. b) Minimum of 3 years teaching experience as Resident / Registrar / Demonstrator / Tutor in a recognized Medical college / Institute in the concerned Subject. Candidates are required to apply to The Chairman, at TATYASAHEB KORE DENTAL COLLEGE & RESEARCH CENTRE, New Pargaon, Tal. Hatkanangale, Dist. Kolhapur – 416 137 on plain paper / prescribed format along with attested copies of certificates and experience certificates.